Shown in picture: Dave Cotton, event MC, Romey Fox, Miss Teen Spokane, Melody Biehl, Founder & President, Patti Roll, Auctioneer, Dave Wakefield, Auction caller, and Jireh Griffin, Miss Cheney Rodeo Queen. We are excited to share with you that over $46,000 was raised at this year’s event! 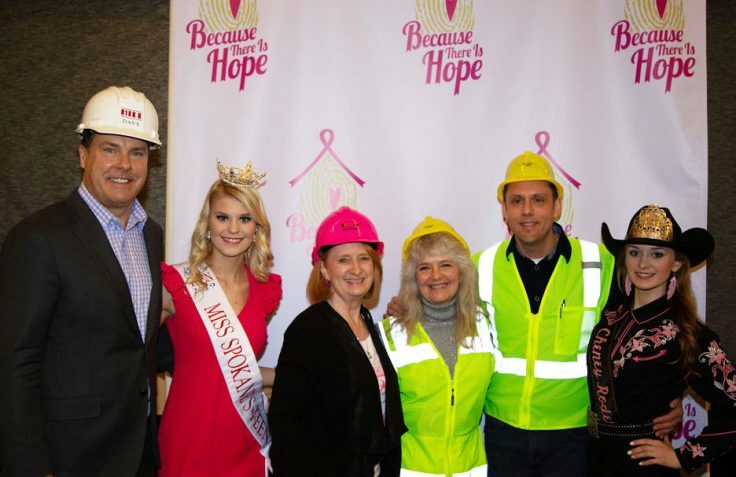 Thank you to . . . .
“Because There Is Hope’s” Board Members and to All of our Volunteers that were a part of making our 15th Annual Fundraiser, High Heels & Hard Hats a success! So many great people to thank! Let’s start with Dave Cotton, the MC for our event. Dave was so great in keeping the audience entertained and excited. The Banner Bank Team. All the people that volunteered from EWI. Andrea Pounder, from Pounders Jewelry. The guys from Scout Troop #448. Romey Fox, Miss Teen Spokane, Jireh Griffin, Miss Cheney Rodeo Queen. Ken Biehl, Isaiah Crane and Rob Hoyem. The event photographer, Justine Periera. Adam Clear, Inland Imaging Videographer. Thank you to Patti Roll, the Auctioneer. David Wakefield, the Auctions Caller. What a team, they did a great job for the event! A grateful Thank you, to all of our awesome event Sponsors. Cancer Care Northwest – Banner Bank – Paul & Michelle Inserra – Great Clips – Inland Imaging – Plastic Surgery NW – Spokane House of Hose – and Spokane Breast Center. Thank you to all the individuals and businesses that donated goods and services to be used in our Raffle and Auctions. You all were so generous! Shedding a Ray of Sunshine on “Melody’s House of Hope”. – Thank you – Sunshine Health Facilities, Inc., proud sponsor of the Patio / Outdoor Living Space that will be a part of Melody’s House of Hope. Thank you Nathan Dikes, President and CEO, for attending our Annual Fundraiser, High Heels and Hard Hats, and with your contribution to the events success! Remember when you #StartWithaSmile, Amazon donates 0.5% of the purchase price to Because There Is Hope. Bookmark the link http://smile.amazon.com/ch/20-1448438 and support us every time you shop.